The second season of the science-themed talk show "StarTalk," hosted by Neil deGrasse Tyson, premiers this Sunday (Oct. 25). The second season of "StarTalk," the science-themed TV talk show hosted by astrophysicist Neil deGrasse Tyson, premiers this Sunday (Oct. 25) on the National Geographic Channel. Based on Tyson's radio show of the same name, the "StarTalk" TV program features interviews and commentary with world leaders, celebrities, scientists and comedians. President Bill Clinton will be the first guest of the new season, which will debut at 11 p.m. EDT/10 p.m. CDT. Check out a clip from the first episode here. "I couldn't think of a more appropriate guest to kick off our second season," Tyson said in a statement from National Geographic Channel. "President Bill Clinton is a public figure whose impact and influence span politics, pop culture and science — with an occasional dose of humor. 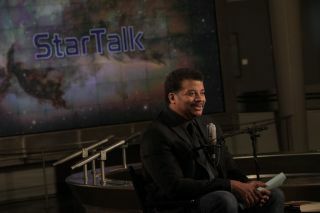 That's exactly the mission statement of 'StarTalk,' and I look forward to sharing our conversation with viewers." The first episode of season 2 has been made available ahead of the official premier, and can be found on natgeotv.com, and through various online providers including Hulu, iTunes and Amazon. Bill Clinton will be the first guest on the second season of the science-themed talk show "StarTalk," hosted by Neil deGrasse Tyson, which premiers this Sunday (Oct. 25). The weekly, hour-long series has a somewhat unique format among talk shows. Each episode centers on a pre-taped interview between Tyson and a special guest (President Clinton, in the first episode). The show then periodically cuts away from the interview, to the Rose Center for Earth and Space at the American Museum of Natural History in New York, where Tyson talks with a "co-host" (typically a comedian) and another guest (often a scientist) in front of a live studio audience. The second season is greenlit for 10 episodes. The 10-episode first season debuted on April 20 and ran through June. Upcoming guests for the second season include Susan Sarandon, Seth MacFarlane, David Byrne, Larry Wilmore, Bas Lansdorp, Penn and Teller, and Brian Cox.